'The Players' by Tom Bender 4 years ago Noticed on Twitter and republished here with permission. 'Bump' by Arijan Jansonius 4 years ago Originally drawn in 1998 here in Cambodia by Dutch artist Arijan (Aryan) Jansonius, inspired by everyday life in Phnom Penh at the time. Motion, knowing detail and the every present rat. Note the old style motorcycle. Issued as one in a set postcards available in Cambodia in the late 90s. 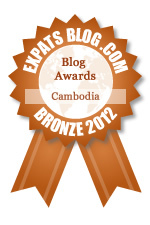 ExpatsBlog.com Expat Blog Awards 2012: Cambodia Bronze Award! This blog won the Bronze Award for best expat blog in Cambodia!